Why would Google blacklist bit.ly? Google has many automated processes to detect if a specific domain is hosting malware, redirecting to malware or somehow being misused to compromise other sites (as an intermediary). It flags thousands of sites every day and it seems that the bit.ly had some redirections that were flagged by their detection process. What is the current listing status for bit.ly? Site is listed as suspicious – visiting this web site may harm your computer. Of the 91549 pages we tested on the site over the past 90 days, 721 page(s) resulted in malicious software being downloaded and installed without user consent. That generally means that someone shortened a URL that was redirecting to a browser exploit kit that was pushing malware to the visitors visiting this page. This iframe injection has a bit.ly link that redirects to a drive-by-download hosted at httx://teamliboza[.]nl/streamplayer1.php. It happens often with bit.ly and other URL shortens. This new blacklisting status could be a change in tide for URL shorteners as Google takes a hard stance against how attackers employ them to distribute malware. That or they could be legitimately blocked, it’s just hard to say at the moment. Whether they are actually hacked or being tagged for what others are doing will require more time and analysis as it’s a very unique situation. For now however, if you depend on the shortening service, if you want people to see your content it’s best to avoid the service until the issue has been resolved. Additionally, if you leverage the shortener in your own website this could be impactful to you as your website could get inadvertently blacklisted for loading a blacklisted website. Something to be mindful of. The good news is that the blacklist will be for the shortener, so removing it will address the problem, but the bad news is that most end-users won’t read the details and assume it’s you. We will keep monitoring this issue closely and we will post an update as soon as we hear more. In the mean time, do not visit bit.ly links and replace them with their real final destination URL. What is the current listing status for bit.ly? Interesting. I’ve been wondering when (if) this would ever happen. I’m even more curious to know what would happen if Google’s own URL shortner goo.gl was involved. Thanks for the heads up. I use Bit.ly with a custom domain and have it set up in Tweetdeck and on my site via the WooThemes plugin WooDojo Shortlinks. I assume I should turn these off until further notice …. thanks! Do you know if the same warning will apply for sites using their own URL’s through bit.ly? I’ve purchased a domain name for this purpose but haven’t set it up yet; I’m wondering if this might be a good time to do that! This is SUCH a P.I.T.A.! 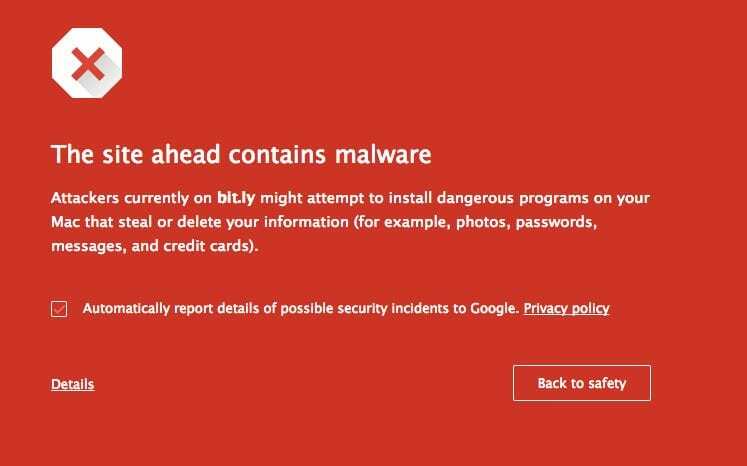 I have Biy.ly links ALL over my site and now the Grand-Goog’ has decided that a legitimate service is malicious and my connected relationship my site could be malicious ?!?! AHH! I get it that google is looking for problems and HOPEFULLY Bit.ly will sort out the Issues ASAP. One or two bad apples can really spoil the entire truckload of GOOD ones. How do you feel this will shake out? Do we need to move to another URL shortening service to avoid this mess? Do you feel that Bit.ly “could” fix the issue and return all GOOD sites back to “safe” status? Many are saying this is cleared now. Got an update? Is it a bitly link? They have sandboxed themselves 4 or 5 years ago. Was for an seo no-no of some sort. They penalized themselves multiple times. Most notably the time a few years ago when Google Japan tried to get Japanese bloggers to create Google-centric content and try to push past Yahoo! Japan in market share. Great to see that google has changed their mind. Disproportionate response much.